One of my most successful series of articles — at least if you go by the number of comments — is the three article series I ran about keeping a reading journal. Why keep a journal, what should be in a journal, what kind of journal should I use? All these and more are discussed in this series. This year saw the Third Annual Black Quill Awards held by Dark Scribe Magazine. The awards focus on horror fiction and are unique in that there are two awards presented for each category. One is the Editor’s Choice Award and the other is the Reader’s Choice Award which was determined by open voting by the magazine subscribers. Below is a list of posts that appeared on . . . With Intent to Commit Horror. The first eight lists the nominations in each category and the last lists the award winners. The books in these lists have links to online bookstores in case any of them peak your interest. Do you love Horror fiction? Do you wish you had one place where you could find all the great horror novels, collections and anthologies being published today by the small speciality presses? Horror Mall is the place you need to visit and the Introduction to Horror Mall Series is a collection of articles I wrote to guide through the place. From finding a book to checkout to downloading an ebook, this series will make it all seem easy. Part 1 — What is Horror Mall, Anyway? Part 2 — How Can I Find Stuff at Horror Mall? Part 3 — How Do I Purchase Stuff at Horror Mall? Part 5 — What if I Have Problems at Horror Mall? Not long ago on my website …With Intent to Commit Horror I ran a series detailing the 2008 Stoker Award nominations and the winners. These entries were linked to an online bookstore in case a reader wanted more information or to purchase the book. Part 5 — Bram Stoker Award for Lifetime Achievement and other awards. I’ve been working on this stuff for months and yet I still ran it down to the wire when it came to writing about the things I’d been doing. Sure I have excuses — two demanding blogs, two more demanding children, sickness and chores . . .and, oh yes, a full time job so that all my demanding children can eat. Mostly I enjoyed doing the things — less than enjoyed writing about it. I think I felt like this was being turned in for a grade or something. The nice thing is that I’ve come away with a number of tools that I’ll be using and exploring for my blogs and my work. I also have a new perspective on why a silly little associate librarian is “branding” himself. And its not just vanity. Dr. Schultz said so . . . honest. This was a wonderful program for getting me to stretch my web 2.0 muscles and try a few new things. Considering that we, as librarians, are going to need to help customers through these websites and tools means that ultimately this will prove to have been an invaluable experience. And now that its all done, I want to go publish my librarian card in my other blogs. As you can see below, I made a librarian trading card for myself. I had a lot of trouble uploading it to my blog — that took a few days and a couple of sessions of anger management before I finally figured out how to do it. I can be a touch slow a times. I had fun designing a trading card and I hope I clicked the right button to send it to the pages of collected librarian trading cards. Graphics are a weak point for me so I’ve been nervous doing the Flickr assignments. It shows in the number of mistakes I made and the problems I had posting the card to my blog. Of course, if I keep at it, I’ll eventually get comfortable with this stuff and then one day I’ll be a Flickr whiz before I even know it. In the meantime I’ll keep plugging away one image at a time. I played with Flickr for a while and did a number of searches before I found this photo. Here is the URL for the photo called The Horror is Back…. If you go to the Flickr page, you’ll notice that there is a note concerning the hand of the girl in the image. I thought that was cool. I think I’ll be using Flickr to support adding and controlling images in my various blogs. It seems like something I should have been doing all along. 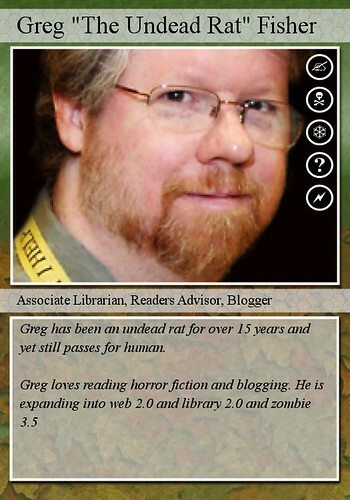 My Librarian Trading Card, originally uploaded by theundeadrat. This is my librarian trading card. I read and read and read until my mind went numb and my eyes bled out. The I came upon the OCLC article and a ray of sunshine lit the computer screen and its warmth took the chill out of my bones. Here at last were people speaking the kinds of things I’ve been groping towards for the last couple of years. Library 3.0 — Library 3D. I am not into second life or its 3D avatars but I do get the concept of people collecting librarians rather than books. That is exactly where I’ve been going without realizing it. The Undead Rat is a brand — an easy to remember name for a service I can uniquely provide. I can help clear the fog in one specific area — readers’ advisory in general and horror fiction in particular. And I am doing just that in my blogs. Collect me and make me your personal librarian. As good as I am, Jo Ann Vicarel is head and shoulders above me. Collect her because you’ll never find a better guide through the morass of mystery fiction. You want art? You want to learn to create art or just read about art? Collect Carole Wallencheck who can guide you through the labyrinthine catacombs of the creative unconscious made manifest. Looking for a good thrill? I have a brand new Pat Grey playing card right here and I’ll trade it for a Traveler librarian like Raidene Hebert. We’re not interchangeable . . . we never were. We all share certain baseline skills but so many of us excel on our own in accordance to our abilities and talents . . . we’ve become collectible. We can get information, organize it and teach you to use it and that makes us all very special, very valuable collectors items. So, how much do you think I can get for myself on e-bay? "Among libraries, lifelong learning is one of those core values we shelve our books by."